Special Note: Orders are now available on this site! Order Book 1 now for 26.00, which includes FREE shipping and taxes. of The Companies We Keep 5 FREE! Price includes shipping and taxes. All books will be signed "Aloha, Bob Sigall." If you want yours to be personalized, send the author an email at Sigall@yahoo.com and tell him how you want the book(s) signed. “People in Hawaii will find it a nostalgic trip down memory lane. 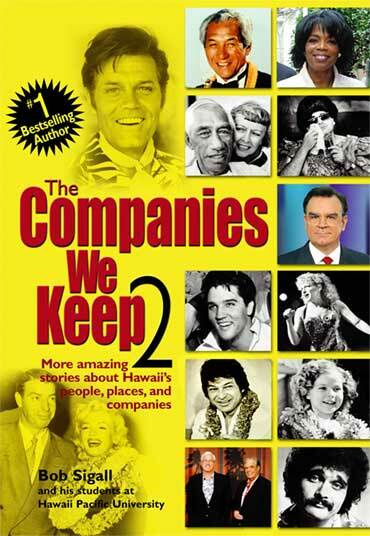 The follow up to Bob Sigall’s #1 bestselling book, contains more amazing stories about Hawaii people, places and companies. What Imelda Marcos thought of Frank De Lima’s impression of her? One night, Jim Nabors brought Doris Duke and Imelda Marcos to see De Lima’s show at the Noodle Shop. She went backstage to talk with him afterwards. What did she think of the show? She was amazed, she said, at how much he looked like her! The KHON newscaster has been anchor for an amazing 27 years now. He sat down with the author to talk about his career, his connection to Aiea high school and his son, Bryce. And now that he’s at the tail end of his career, he told us what he thinks is the secret to his longevity and success. Few know that Duke Kahanamoku and his father were named for a visiting dignitary who came to Hawaii in 1869. How Shirley Temple met her future husband in Hawaii. Charles Black didn’t know who Shirley Temple was when he met her at a party in Hawaii. That was part of his appeal to her and she was in love at first sight, she said. They were married 53 years. Who was Hawaii’s first visitor from Japan? In 1844, five young fishermen were shipwrecked off Japan in a storm. An American whaling ship brought them to Hawaii. One, “John” Manjiro, ended up advising and translating when Commodore Perry arrived in Japan, and was made a samurai for his service. Captain Cook found Hawaiians surfing when he arrived here, but can you guess the other three major sports that were created or influenced by people who lived in Hawaii? Kui Lee wrote many of Don Ho’s hits. Who was Kui Lee referring to when he wrote I’ll Remember You? What did Don Ho say he’d name the White House when he was elected the first Hawaiian U.S. President? Whose idea was Magic Island? In 1955, one man suggested two large islands be built in addition to the peninsula he called Magic Island. He wanted to build waterways, bridges and six hotels on them. Who was this Hawaii visionary? • Which other names were considered for Aloha Stadium? • How Elvis Presley helped build the Arizona Memorial. • When Babe Ruth played baseball in Hilo. • The plan to extend the Ala Wai Canal to Pearl Harbor. • How an Aiea girl became the Divine Miss M.
• A replica of Iolani Palace was built out of snow at the Sapporo Snow Festival in 1982. • Which U.S. President visited Papakolea? • How the Polynesian Cultural Center began in Waikiki. • Who Duke Kahanamoku was named for. • Sports legend Jackie Robinson played semi-pro football in Hawaii in 1941 before breaking baseball’s color barrier. • Former Mayor Neal Blaisdell once pitched for the Baltimore Orioles. • The U.H. “Rainbow” nickname was given by reporters when a rainbow appeared during a game, soon followed by a touchdown. • Jesus can be found surfing in the stained glass window at St. Andrews Cthedral. • The Ala Wai Canal was originally supposed to go all the way to the ocean near the Natatorium and form a recreational lake in Kapiolani Park. via our secure payment site for only $26.00, with FREE shipping and taxes. via our secure payment site for only $52.00, which includes shipping and taxes. 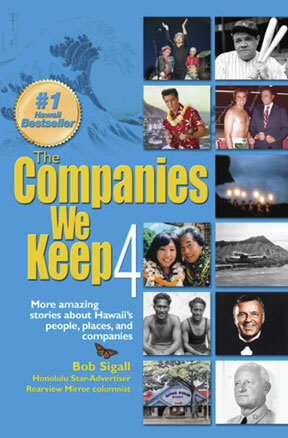 Or, buy ALL FIVE books for only $115.00, and get a second copy of The Companies We Keep 5 FREE! Note: When you click the BUY NOW button below below and get to the order information, it will say quantity of 1 for $115. This is to mean all 6 books will be shipped to you for $115, which includes taxes and shipping. Mahalo. For book orders of more than 10 copies, please contact us directly at companieswekeep.com. Mahalo! ... also, look for the book now at your favorite bookstores around the islands. Books will be sent via US Postal Service. United States destinations, USPS Priority 2-3 days: FREE! with these laws. Please contact your local customs office for more information.